The hero of this week is Guardian. None of his skill could deal damage to enemy or heal his ally. Then what\'s special with him? Is he a good hero to have in the team? Let\'s find out. 1) Post a reply with the strategy or background about the weekly hero/angel. 1 Tank like Zweihander , Nether Knight , Paladin or Valkyrie. Its either the enemy team will Lose all their heroes trying to kill you or Lose the match Trying to kill one of your Heroes. What makes the guardian special is if you put him in the front row along side to other heroes he can give them all a shield which makes it very difficult to kill them while they have a shield. So when you see a guardian in the front row you should try and take him out first and if you don\'t kill him before he gives the shield then your pretty much going to lose the fight. Guardian appears to be really annoying to face if hes decked out, with a decent team. i\'ve only just unlocked mine so haven\'t gotten to try him (ty for events to help unlock him) but the shield for the front line is really nice for sustainability. angel ;Trial :;prevent dmg from the enemy using his shields, saving your HP as you can ;go to higher floors. Use him with an atack team. PVP: Perfect, usefull for defense team. Use him with Dark paladim and Hecate front line and Djinny+ Sentinel backline. Sorry about posting twice. can\'t delete or edit the previous. Guardian is perhaps one of the most underrated heroes in the game. I have noticed recently though that people in the upper levels of arena are figuring out how good this guy is. 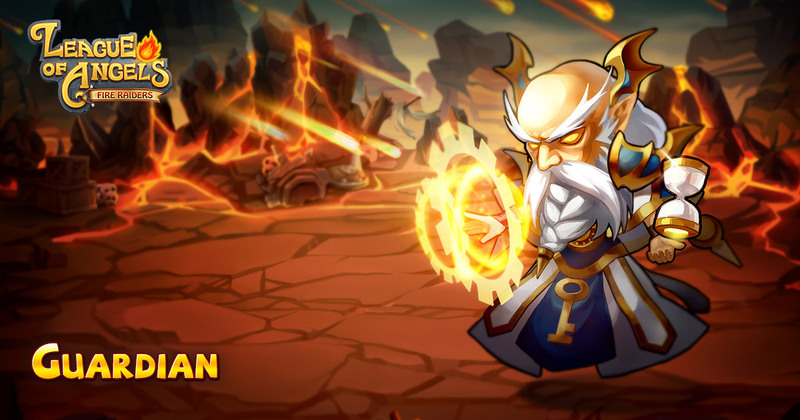 The lack of interest in him most likely stems from the fact that he is a support type hero without a heal, playing second fiddle to heroes such as Mermaid and Djinni. Don\'t be fooled. The shield that this guy gives is worth having him around. It affects your entire front line, and is very difficult to break through. If it goes off at a crucial moment in arena, you\'ll most likely win. His secondary abilities aren\'t game breaking, but they aren\'t irrelevant either. Raising the attack of your team and lowering the attack of your enemies is a fine skill, possibly pushing your heavy hitters over the edge so they can burst down that annoying Nether Knight or Zweihander. His purple skill simply increases HP, which seems a little out of place on a support, but combined with his shield, it does allow him some flexibility when it comes to battle placement, meaning he can stand in as a third front liner in a pinch, should the situation call for it. All in all, he\'s one of the better supports and worth investing your time into. 2019-4-25 04:39 GMT+8 , Processed in 0.068623 second(s), 52 queries .